Weeks after civil rights advocates began receiving notifications from the Department of Education that their cases regarding discrimination in schools were being dismissed, three national groups filed a lawsuit Thursday arguing that the department’s new complaint guidelines are undermining its own obligation to investigate civil rights violations. 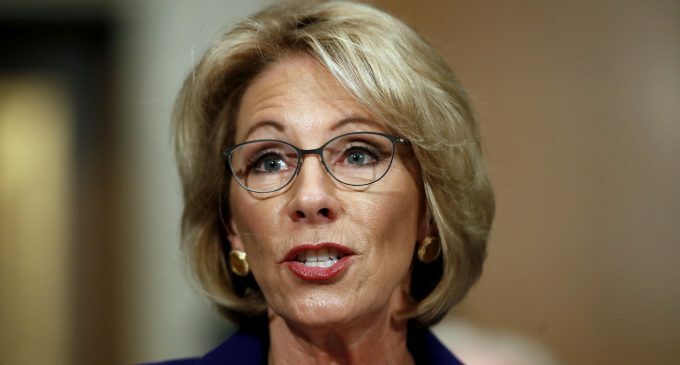 Claiming that civil rights complaints can place an “unreasonable burden” on its Office for Civil Rights (OCR), Education Secretary Betsy DeVos as revised the department’s procedures. The new guidelines allow officials to dismiss hundreds of complaints regarding unfair treatment of students of color, inadequate resources for students with disabilities, and other forms of systemic discrimination. The appeals process for resolutions has also being eliminated. The NAACP, the National Federation of the Blind, and the Council of Parent Attorneys and Advocates argue that the changes are unlawful and have asked a judge to block the department from enforcing the new guidelines. Filing complaints with the DOE has been “one way, sometimes the only way, for vulnerable people who can’t afford to litigate, to get their cases heard, and that’s being taken away,” Eve Hill, the plaintiff’s lawyer, told the New York Times. The new policy will allow the dismissal of cases that fit a “pattern” of multiple complaints filed by individuals or advocacy groups. For example, Lipsitt—who has been labeled a “frequent flier” by the department—has successfully reached more than 1,000 agreements with schools in which the institutions have agreed to make their websites accessible to people who are deaf or blind. About 500 of Lipsitt’s new complaints have been dismissed, the Times reported. Joey Poirier, a special education advocate who’s filed dozens of civil rights complaints against school districts in Florida, has also been notified that 10 of his open cases have been closed due to the new procedure. The post As Civil Rights Cases Are Dismissed, National Groups Take on DeVos appeared first on MintPress News.